There is an explanation I have always used for my sincerest dislike of the MEDC, its mission, and how it takes advantage of the taxpayer for political payoff. Its hard to be any clearer than that. Any politico who uses the term “Jobs created” when discussing the MEDC grants, is trying to justify the stealing that must happen first, and is central to the MEDC program. In the history of subsidizing business, one would think that the predictions of ‘job growth’ with accomplished results would speak for itself. In fact, one might think such mechanisms insofar as they are touted, would make the news at least once a month if not weekly as a raging human interest success worthy of celebration. Instead we’ve seen different versions of the play starring massive failure in the lead role, and fraud as its understudy. And while all that fun is happening, information is being locked down so that folks can’t find out what the score of this really bad performance is. Those contracts are a pretty big deal already. When Obama says “You didn’t build that,” perhaps he was talking about those businesses that rely on government to spend with them to grow and prosper. A former drag racer turned pilot, turned airline owner, Connie Kalitta is doing OK, and he is indeed living the American dream. Yet he is quite awake. Once upon a time, a business would make, or sell a product, offer service along side it, price it fairly enough to meet market demand and then live or die by the revenue generated minus the cost of doing business. Simple business practices of controlling expenses and maximizing revenues seem to be fading it seems. Unfortunately, today’s business model involves discovering alternative ways of operating in which entrepreneurs can finance their endeavors with other people’s money. The MEDC serves that model overly well, and Kalitta has been diligent in his pursuit of that method to this happy ending. In Oscoda Township, Kalitta Air received a $2 million grant to help them construct a new 80,000 square foot airplane hangar. The company, led by CEO Connie Kalitta, flies cargo to destinations across the world. The expansion is expected to create upwards of 200 jobs, and Kalitta said he’s happy to be growing in Michigan. Richard Bray, the director of Kalitta Air Power Plants, said that he believes nearly 90% of the people that work at Kalitta Air are from the surrounding region. The Michigan-based company has been aggressively expanding in recent years, finishing a new addition to their facility two years ago and building a new machine shop this year. “We’re very proud of what we have here. It’s a good, well-oiled machine,” Kalitta said. Of course it has been a long haul. Through Multiple administrations the drag-racer-turned-air-magnate worked the system. Aside from a number of earlier donations and starting in the early 2000s, the speaker of the house Andy Dillon, governor Jennifer Granholm, and other Democrats received their proper tribute from Kalitta. As the administrations changed, or were changing, bets were hedged, and access guaranteed. Indeed, the man is a player! A special announcement was also made at the press conference. Kalitta Motorsports and the Michigan Economic Development Corp. have teamed up for a special promotion to stimulate economic growth as well as to retain skilled labor in Michigan. As part of the program, the Kalitta team has donated space on the Kalitta Air Top Fueler for Michigan Economic Development Corp. decals at this weekend’s event in Norwalk. However, a perceived debt for both his employment of vets and others over the years can seem a little overpaid when it requires pilfering the reward from other business operators who pay taxes in Michigan. A “little overpaid” of course, is a phrase that hardly concerns those who are capable of untold benevolence with other people’s money. Influence along the way as described above has had its payoff. Smaller grants from the MEDC, the Wayne county Edge, Aerotropolis incentives, valuable praise from the MEDC, and now a big $2 mill CASH payday along with a cool promo video (above) to build an 80,000 square foot hanger for his privately owned for-profit LLC business. Tell me it wouldn’t get built otherwise. 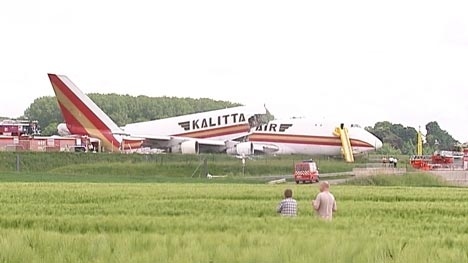 Despite the fact that Kalitta has a slew of 747s, they can't afford to pay for a hangar? Also, $2 Million for an 80,000 Sq. Ft. hangar seems a bit pricey.. Sounds about right for a decommissioned Air Force base with a few foundations already where old hangers were torn down, and factoring in prevailing wage. Of course, here is another part of the story that is omitted. When the State of Michigan declared the former Wurtsmith Air Force Base a Renaissance Zone [see P.A. 376 of 1996], it created a unique tax haven for a new or expanding business. Under Renaissance Zone status, businesses within the zone are exempt from virtually all state and local taxes for 15 years. That means no Personal Income Tax, no Single Business tax, no State Education tax, no Real Property Tax and no Personal Property Tax. The only exception is locally enacted millages for debt retirement. Nice little added afterburner turned on for a d/b/a cargo airline to rise from the ashes, yes? Meh. The whole damn area's been greased palms for a few ever since Tony Decker's closed, and Third world voting Schostak built a Burger Whop.